Sc. cerevisiae sp. boulardii preparation. Biolatte Oy brought Sc. boulardii to the market already in 2000. Bulking agent (maltodextrin, microcrystalline cellulose), Saccharomyces boulardii, gelatin (bovine). 1-2 capsules a day with water. 1 sachet a day mixed with water. 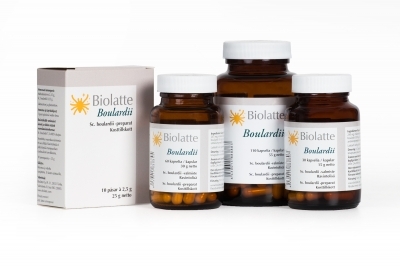 Boulardii can be taken at any time of the day. Do not exceed the recommended dose. Dietary supplements should not replace the variety of foods important to a healthy diet. Keep out of reach of children. The use of Saccharomyces cerevisiae var. boulardii is contraindicated for immunocompromized persons, as well as for patients with a central venous catheter in place. Sales authorisation in the EU (number AS 2251/6).